Most people, at least when queried, will tend to identify humans as possessing five senses: seeing, hearing, tasting, smelling and touching. The more bold among us might also add a sixth sense – perhaps a sense of time, or even ESP. These conceptions of how we sense our environment have been the topic of a couple of thousand years of philosophical scrutiny and more recent scientific inquiry. Yet it is notable that both the scientific evidence on the topic, and numerous theories in the history of psychology, seem to have rejected the idea of the five senses. More than 2000 years ago, Aristotle described a set of five sensory objects (Everson, 1999; Sorabji, 1971). Visual sensory properties were theorised that put us in contact with the distance and brightness of objects; acoustic sensory properties related to us the distance and loudness of objects; odours/smells linked the distance-oriented senses with the direct-contact senses; touch (including a subcategory for taste) informed a perceiver about objects in direct contact with the body; and a common sense served to combine and coordinate the externally derived sensory properties. Aristotle determined these sensory qualia using his own rigorous approach to introspection and with respect to maintaining a number consistent with the five classical elements: fire, water, air, earth, quintessence/aether. While these five senses (and the five elements) are no longer accepted scientific descriptions, the number five and the five conceptions of external sensory properties have provided a context for the senses that continues to guide our culturally accepted standard. But there is a historical precedence for cultures to include both greater and fewer numbers of senses. Philo of Alexandria (circa 20 ce), described seven senses, adding speech and sexual interaction as a distinct sensory categories (Claussen, 1993). The significance of speech for humans has earned its categorisation as a separate sense in philosophy (e.g. Ramon Llull, early 14th century) and in some other cultures. The independent conception of speech is supported with modern evidence of partially distinct neural processing areas for speech and functional differences between hearing speech and other sounds (Liberman & Mattingly, 1985). And the West African Hausa have a tradition of distinguishing only two senses: vision and everything else. Given the very strong behavioural influence of vision relative to other senses in humans, and the fact that vision maintains the largest cortical space in the brain of any function, this distinction may have as much scientific validity as the concept that there are five senses. How has psychology set about ‘finding the senses’? Here, we need to appreciate that the onset of psychology as a scientific discipline in the 19th century is firmly rooted in sensory and perceptual studies. By the mid-1850s Gustav Fechner and Hermann von Helmholtz were independently conducting research on the relationship between physical stimuli and sensory reactions. Both contributed research findings that remain valid, and they were able to establish the rigorous methods that continue to form the basis of psychophysical studies (e.g. Fechner, 1860/1966; Helmholtz, 1863). The categorisation of the senses that emerges from these early psychophysical studies is one that relates to the energetic media detected. Hearing is measured as a function of the intensity and physical quality of tones; vision functions to interpret and measure quantities of electromagnetic energy in the visible range. The number and categories of specific senses is not explicitly defined: the theoretical emphasis is to determine the media first, then how the body responds. Consider the classes of energy in the environment – kinetic energy such as supports the sensitivity to temperatures, vibrations/sounds, and pressures, electromagnetic radiation including visible light, and chemical gradients. If we use these to determine the divisions of the senses, there are not five senses; there are likely fewer (or possibly many more) depending on whether the definitions are constrained to specific ranges within a spectrum. With the onset of experimental psychology as a recognised scientific discipline, many of the earliest studies investigated sensory apprehension, processing and phenomenology. Wilhelm Wundt (e.g. 1862, 1894) defined a set of experimental methods for the new discipline, including structured introspection and other psycho-empirical methods. Using a variant of Wundt’s approach, Edward Titchener established the Structuralist movement and sought to create a table of elements that would form the building blocks of the sensory experience, consciousness, cognition and phenomenology (Benjamin, 2007; Titchener, 1908). Like the periodic table of elements in chemistry, Titchener and colleagues collected data on what they theorised were the atomistic elements of sensation. Their table consists of more than 44,000 distinct sensory elements including hues, durations, extents, affective dispositions, and other low-level phenomenological qualities. Perception was thought to consist of various combinations of these sensory elements. For the most part, these sensory elements were designed to fit the commonly accepted model, although the affective dispositions that were included, among other things, allowed for sensory experiences beyond the five. In the same context of the early 20th century, Charles Myers produced one of the first textbooks and courses on experimental psychology at Cambridge University (Myers, 1909). In it he explicitly described and explored eight or more distinct senses: labyrinthine sensations (balance-inner ear); motor sensations (kinesthetic reactions); auditory sensations (cochlea); visual sensations (retina); gustatory sensations (taste buds); olfactory sensations (nose); and a complex group of cutaneous and visceral reactions – with likely distinctions between sensations of temperature and pressure. The eight or more senses were distinguished with respect to their specific nerve energies (e.g. Müller, 1826), the theory being that whatever the stimulating media, a specific nerve will only respond with a very restricted, and thus classifiable, sensory reaction. From this perspective, auditory sensations are segregated by the fact that if there is sufficient stimulation to cause a reaction in the cochlea, as would occur in response to vibration, then the perceiver will experience a sound. The fact that blunt force, electrical stimulation, and/or chemical exposures can also cause the cochlea to respond (and produce an auditory sensation), supports the notion that it is the specific nerve stimulation, and its respective phenomenology, that define a given sense. As per this doctrine, Myers is able classify his eight or more types of reactions. Current evidence on the kinds of sensory receptors and segregated neural pathways is more consistent with Myers’ (1909) perspective than with the traditional five-senses system. Humans have been found to employ an extraordinary set of receptors that differ in morphology, reactivity and locations of the body. The complicated somatosensory system (involved in touch), by itself, has more than five modes of sensing and multiple neural pathways. 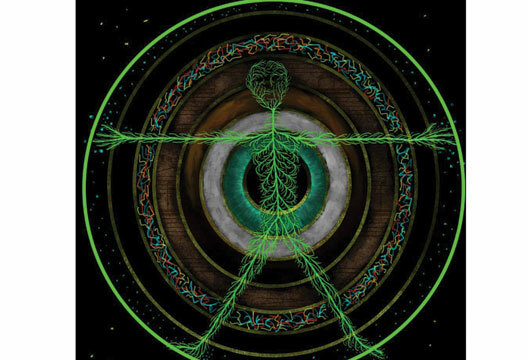 Vibratory energy at lower frequencies may be absorbed by Meissner’s corpuscles, found subcutaneously and able to respond to frequencies from 10 to 100 Hz; at higher frequencies a different set of somatosensory receptors will become responsive. Two different sets of receptors are sensitive to pressure on the skin (Ruffini’s endings and Merkel’s discs), another receptor for pain and temperature (free nerve endings), and others. Visually, humans use two types of receptors (rods and cones), and typically three subtypes of cones (differentially sensitive to shorter, medium and longer wavelength electromagnetic energy in the visual range). While vision may seem uniform, the receptors are distributed across different parts of the retina, locally processed with different ganglia in the eye, and partially segregated along neural pathways to the brain. Similar analyses could be made for auditory, olfactory and gustatory receptors. In addition there is strong scientific support for, at least, partially distinct neural areas to process speech, faces, time, emotion, music, circadian rhythms, echolocation and space/navigation (see Fain, 2003; Uttal, 1973). Myers’ distinction of eight or more senses captures some of this emerging evidence of the complexity of the senses. Using the specific nerve energies to separate out the senses allows for a dozen or more separate modes of sensing. In 1875, the year that Wundt had rooms set aside for his laboratory at University of Leipzig, William James established his psychological laboratory in the basement at Harvard University. Like Wundt, James theorised that sensory reactions provided the foundational pieces of our conscious experience. He further emphasised the potential deceptions of our sensory system, including perceived changes in colours against varying backgrounds, and ‘that all our sense-organs influence each other’s sense organs’ (James, 1890, p.676). In this approach the senses are experienced as part objective response to stimuli within a particular context, and part of a more interpretative-associative experience. For James, the senses provide a critical link to an external reality. Our phenomenology, and by extension the senses, are classified with respect to changes in environmental context and experiences. This viewpoint is quite consistent with current theories suggesting incredible amounts of neural plasticity (e.g. Buonomano & Merzenich, 1998; Mercado, 2008). Moreover, with the growing body of evidence that suggests frequent intermodal neural activity (multisensory, massively parallel processing systems), James’s relativistic approach to the senses may be particularly valid. Benjamin, L.T. (2007). A brief history of modern psychology. Malden, MA: Blackwell. Buonomano, D.V. & Merzenich, M.M. (1998). Cortical plasticity. Annual Reviews of Neuroscience, 21, 149–186. Claussen, C. (1993). Worlds of sense. London: Routledge. Everson, S. (1999). Aristotle on perception. Oxford: Oxford University Press. Fain, G. (2003). Sensory transduction. Sunderland, MA: Sinauer Associates. Helmholtz, H. (1863). Handbook of physiological optics. Leipzig: Voss. James, W. (1890). The principles of psychology. Cambridge, MA: Harvard University Press. Liberman, A.M. & Mattingly, I.G. (1985). The motor theory of speech perception revised. Cognition, 21, 1–36. Massaro, D. (1998). Perceiving talking faces. Cambridge, MA: MIT Press. Mercado, E., III (2008). Neural and cognitive plasticity: From maps to minds. Psychological Bulletin, 134, 109–137. Müller, J. (1826). Zur vergleichenden Physiologie des Gesichtessinnes des Menschen und der Tiere. Leipzig: Knobloch. Myers, C.S. (1909). A text-book of experimental psychology. London: Edward Arnold. Sorabji, R. (1971). Aristotle on demarcating the five senses. Philosophical Review, 80, 55–79. Titchener, E.B. (1908). Lectures on the elementary psychology of feeling and attention. New York: Macmillan. Uttal, W.R. (1973). The psychobiology of sensory coding. New York: Harper & Row. Wundt, W.M. (1862). Contributions to a theory of sense perception. Leipzig: University of Leipzig. Wundt, W.M. (1894). Lectures on human & animal psychology (2nd edn) (J.E. Creighton & E.B. Titchener, Trans.). London: Swan Sonnenschein & Co.